Cut the squash in half, lengthwise and put them face down in a baking dish. Add enough water to cover the squash by 1/4". 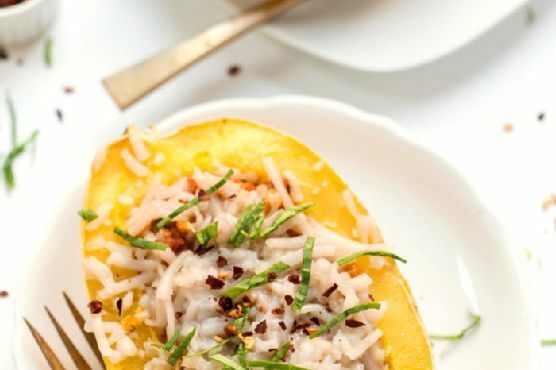 Roast squash for 20 minutes.While the squash is cooking, add the remaining ingredients (minus the cheese) into a saucepan. Start with just 1/2 cup of water and add more as needed. Bring the pot to boil, then reduce and simmer until thickened, about 10 - 15 minutes. Once squash is done roasting, remove from oven, flip over and scoop out the seeds. Fill each squash half with about 1 cup of sauce. Sprinkle with cheese.